I have just finished reading THE most amazing book I’ve come across in a long time! 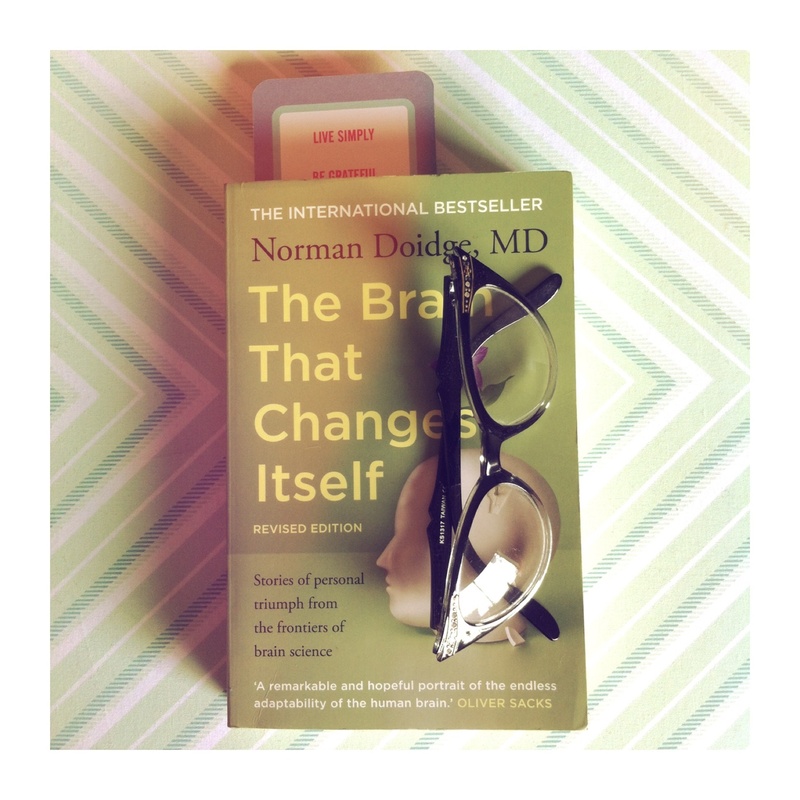 ‘The Brain That Changes Itself’, Norman Doidge MD, about neuroplasticity and how the old view of the adult brain being an unchanging and fixed structure is being totally turned on its head by new scientific discovery. Doidge is a psychiatrist and researcher and the book uses a number of very interesting case studies in each chapter as well as giving a great, and accessible, overview of the latest research science has about neuroplasticity, the adult brain and how it changes radically when required (and sometimes when you don’t want it to!) and how kiddo’s and their brains develop. It’s a fascinating read and as I hardly ever read fiction it’s right up my alley. I’ll preface this little review by saying that if you’re a passionate fiction reader this probably isn’t the book for you. But if you’re interested in people and why they act the way they do (I mean, seriously, who isn’t?) human science, changing habits, why we do what we do and how we can change, this is an amazing and enlightening book! Our brain ‘maps’ the information that we learn. Like a route on a Google map (or Melways for us oldies from Melbourne!) that we use all the time, we can clearly see the path we take to do certain things – whether or not these things are conscious to us. For those regular readers you’ll know my back pain and recent hospital admission drama but I’m learning that the pain in my back that I’ve been suffering from for over 20 years, isn’t actually a huge thing physically, but is actually a ‘learned’ response from my brain! Honestly, this is mind-blowing for me, knowing that with the correct brain training, pain relief and physical exercise I can actually lessen my symptoms and retrain my brain to recognize that the massive pain I experience doesn’t actually mean I’m about to slip a disc or something serious, but it may be more of a learned response to a smaller, and less serious, injury. Over the years my brain has ‘mapped’ a learned response to an injury that was never properly dealt with on all levels in the first place – physical therapy and pain management, etc. So each time I do something to aggravate my back it causes, what should be to most people, a small inflammatory response to heal a muscle; my brain tells my body that my back is about to be severely damaged and pulls out all the stops to ensure I don’t move and hurt it more. That means heaps of pain, loss of movement with muscle spasm and lots of inflammation… not to mention paramedics, heaps of drugs and a trip to hospital. I am now so much more aware of the fact that my brain has mapped this, frankly insane, response to what isn’t a new major injury, but is just a long-standing injury that is serious, yes, but not as serious as my brain considers it! I am now waiting to be accepted into a pain management program that will utilize physical therapy, psychology, medication and a number of other techniques to retrain my brain and body to see the pain for what it actually is, not what my brain ‘thinks’ it is. Anyhow… back to the book! Hearing problems may be the cause, with some kids, of learning difficulties because if information goes into the brain ‘muffled’ it is also remembered that way. I think there’s something in that for all of us… Multi-tasking, being unconnected with a conversation or not fully listening to somebody doesn’t make for great long-term relations. An amazing computer program developed for children with learning difficulties in the language area is having astounding results for children with autism too. Case studies are finding that upon using the program these autistic children are becoming more connected socially, their language and autistic symptoms seemed to be fading, and some children are very quickly moving from severe language impairment into the normal range. This chapter is just so interesting and you’ll see that if we are learning something new or wanting to change habits we need a reward. This may just be a positive reinforcement such as a hug, a kind word or a visual reminder of how awesome we are – and this will be backed up with improved motivation and sharpening of new ‘brain maps’ for our new, and better, habits. You’ll learn that new neurons can be turned on in our brains, no matter our age, although the younger you begin training your brain, the better you’ll be. The old axiom, use it or lose it, definitely applies in brain science. So it is very beneficial to continue learning new things, travelling, moving and exercising. We cannot expect to stay ‘young’ brain-wise by doing the same thing day-in and day-out and practicing the same habits both good or bad. We need to mix things up and get out there! But, remembering the early lesson that we need rewards to ensure our learning stays with us, we should be doing things we’ve always wanted to do – have some fun and don’t waste our lives – to ensure we stay highly motivated, which is crucial to a ‘fresh’ brain. Also, the 1979 book, Drawing from the Right Side of the Brain, by Betty Edwards was amazingly correct in its use of neuroscience and learning. She teaches that the left-side of our brain which perceives things in the ‘verbal, logical and analytic’ and can actually “bully” and overpower the more creative right-side of our brain. Her training turns down the left-side of the brain and students find that they suddenly acquire a knack for drawing rather than acquiring the skill gradually as you would think. I can go on and on, as Mr. Jones will be happy to confirm, about this amazing book and what I’ve learned, but the best that I can do is to encourage you to purchase it yourself and find out just how our brains learn. I’m positive you’ll see a number of different ways that you may have fallen into unhelpful habits or where you could improve your memory or brain in general. The book is published by SCRIBE Melbourne and seems to be available everywhere! By the way, I wasn’t asked, paid or otherwise coerced into writing this review. Although, for future information, science authors I’m seriously open to bribery with chocolate!